Tetworld Center for Peace and Global Gaming Links! an article from ezine "21st"
An excerpt from Fuller's book, "Critical Path"
That's exactly what it is--an observatory! The only difference is that rather than looking outward toward the stars, we are looking inward at Spaceship Earth from a place (in space) outward from the earth. 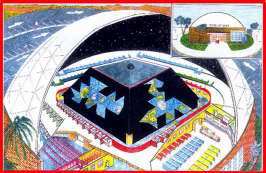 Tetworld "Gameboard"--Buckminster Fuller's Dymaxion Air/Ocean Projection Map! Buckminster Fuller's Dymaxion Map: Click here to see the map in animation and to learn about why it is the best map of planet earth and an ideal global "gameboard"! 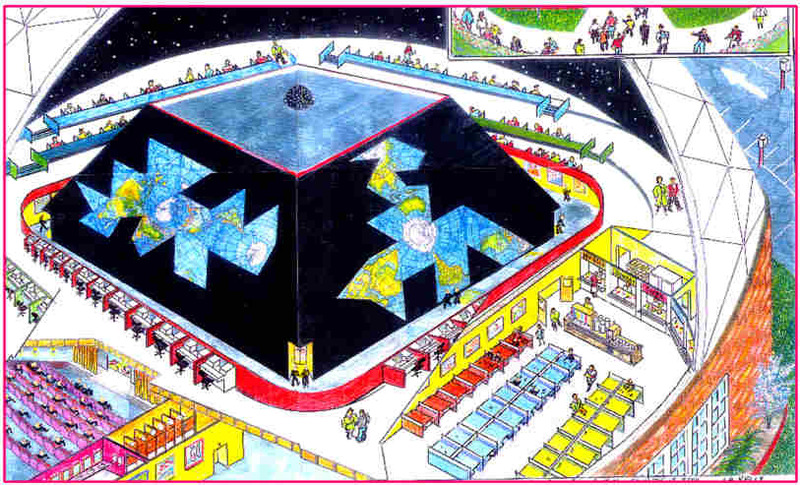 The artist's rendering of the Earth Observatory and Global Gaming CompleX depicted above is Tetworld's interpretation or version of Buckminster Fuller's original concept for a global game--"To Make The World Work For Everyone". This observatory and gaming complex will serve as the prototype for a series of Tetworld observatories and gaming complexes to be placed regionally, around the world--each linked to the others. These complexes will serve to support ongoing gaming "at a distance" via the internet and "in situ", teams "in residence"at the complexes. They will also serve as Tetworld research and development locations. We are seeking support and funding for the Earth Observatory and Gaming Center Complex--which will be housed in a domed structure (as illustrated on this page)--and the huge Dymaxion Maps will be tied into computers that will be able to generate and display a great variety and quantity of data about the earth, universe, environment, planetary life, resources, trends, etc., necessary and requisite to the game and to be used by teams and players to develop strategies leading to our goal of a "World That Works For Everyone"..
Tetworld's Quadtet Global Gaming System: Click here to visit Tetworld's Gaming and Systems Pages"! * Tetworld: Peace Through Development Project is a Research and Development Project of The International Journal of Humanities and Peace (IJHP), a nonprofit 501(c)3 Arizona corporation. Thank you for visiting the Tetworld Center--please return soon! Thank you for visiting--please return soon.